The best situation is for the gauge maker to have your NPTF Master Ring Gage at his plant when he makes the NPTF-L1 Work Plug Gauge. The NPTF-L1 Work Plug Gage will be matched to your NPTF Master Ring Gauge. This may not be cost effective. Expect a calibration fee for your NPTF Master Ring Gage. Expect a fee for matching the NPTF-L1 Work Plug Gauge to your NPTF Master Ring Gage. Expect a longer than normal lead-time. Once the new NPTF-L1 Work Plug Gauge is received in your plant, calibrate it and record your initial reading for comparison at subsequent calibrations. An optimum situation is for you to have the NPTF Master Ring Gage in hand when the NPTF-L1 Work Plug Gauge is new. Once the new NPTF-L1 Work Plug Gage is received in your plant, calibrate it and record your initial reading for comparison at subsequent calibrations. Clean NPTF-L1 Work Plug Gauge and NPTF Master Ring Gage to remove any foreign objects. Inspect the NPTF-L1 Work Plug Gauge for nicks or damage on the threads. Lubricate the gages with light oil. Assemble the NPTF-L1 Work Plug Gage into the NPTF Master Ring Gauge with hand tight pressure. Take a measurement from the NPTF Master Ring Gage Large End Face to the NPTF-L1 Work Plug Gauge Basic Notch. Record this measurement in your calibration record. 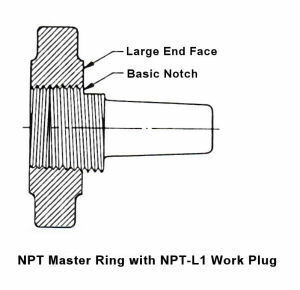 For newly purchased NPTF-L1 Work Plug Gage, or a used NPTF-L1 Work Plug Gauge with no initial calibration result, it is acceptable if measured result is +/- one half of a turn from the NPTF Master Ring Gage Large End Face. For a used NPTF-L1 Work Plug Gauge which has an initial calibration recorded, it is acceptable if measured result is +/- one half of a turn from the recorded new NPTF-L1 Work Plug Gage initial measurement result. If there is not new NPTF-L1 Work Plug Gauge initial measurement result, then NPTF-L1 Work Plug Gage is acceptable if measured result is +/- one half of a turn from the NPTF Master Ring Gauge Large End Face. If a screw thread has broken off the NPTF-L1 Work Plug Gage, use a 60° stone to smooth the margin of the break removing any burrs. Damage which results in a void in the screw thread form is acceptable if not at the small end of NPTF-L1 Work Plug Gauge. Damage in the form of nicks or dings on the screw thread form can be removed with 60° stone. How much is one half of a turn? In case you wish to check my math; one half of a turn = 1"/TPI/2. When we speak of one half of a turn, we are not talking about rotational distance. We are referring to the linear distance along the center line of the screw thread which is made apparent when comparing the NPTF Master Ring Gage Large End Face to the NPTF-L1 Work Plug Gauge Basic Notch. The NPTF-L1 Work Plug Gage is the first gage to be applied to the product screw thread. The NPTF-L3 Work Plug Gage is the second gage to be applied to the product screw thread and its result is related to the result of the NPTF-L1 Work Plug Gage. These two gage members are the minimum requirement for inspecting the NPTF internal product screw thread. Two more gages: Root-Check 6-Step Plug Gage and Crest-Check 6-Step Plug Gage may be required depending on the NPTF class of product screw thread required. The above information has been supplied by USA gage makers. I wish to hear from you if you can validate that this procedure is inaccurate in any way. I pass this data along to you as general accepted procedure, but you may deviate from it as long as you can justify your decision to your management.